Adding billions of tonnes of additional greenhouse gases into the atmosphere each year is loading the climate dice. When you roll the dice, the chances of getting extremes such as droughts, heatwaves and floods increase. In The Conversation, scientist Gary W Yohe lists some of these recent extremes, we’ve been witnessing, including the super-storm Sandy, and suggests that we’re now living in a climate which is transitioning to something for which we don’t have any yardstick from our recent past. This is, argues Yohe, not so much a “new normal” but more a journey to somewhere much less predictable. 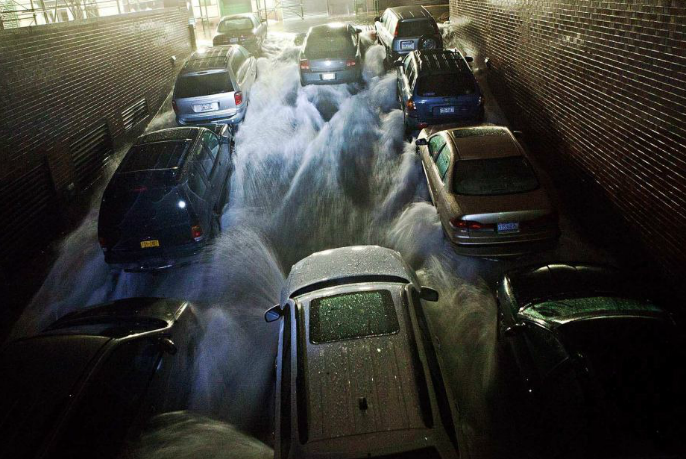 Writing for Mother Jones, Chris Mooney pulls together some of the ways that human activities have likely influenced Sandy, such as the unusually high sea temperatures in the Atlantic. “Warm oceans are jet fuel for hurricanes,” writes Mooney. Also on The Conversation, climate scientist Kevin Trenberth discusses the contribution of rising sea temperatures to Sandy’s muscular gait while keeping a close eye on his wife and daughter as they evacuate New Jersey. New York’s financial district is also “moister than it used to be” as reports come in of cars floating down Wall St. The next few days are uncertain. But what you can guarantee is that climate science deniers will seek to downplay the role of climate change in events like Sandy, or in the US droughts, or the floods of recent years in Pakistan, Russia and Australia, or the tumbling of heat records across the US. 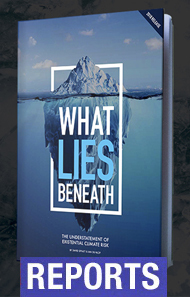 Late last week, PBS screened a documentary as part of their Frontline series called “Climate of Doubt” which looked at the ongoing campaign to demonise and misrepresent the science of climate change. The show used the climate science denying think tank the Heartland Institute’s recent sixth conference on climate change as a hook. The show (watch below) interviewed many of the current protagonists of climate science denial – the “scientists” and professionals who are paid to carry out this work to confuse and fool the public, intimidate climate scientists and push their own political agenda where fossil fuel corporations can operate with near impunity in a “free market”. I recently catalogued the Australian supporters of Heartland’s climate science conferences for DeSmogBlog. The PBS show also highlighted how rich conservative-leaning free market-loving individuals use a secretive slush fund to pay for the work of the climate denialists, an issue I also covered for DeSmogBlog earlier this ear. 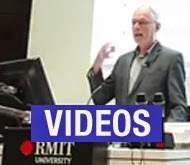 Featured in the show is Dr Fred Singer, a retired physicist and one of the world’s most prominent science contrarians who once helped the tobacco industry to undermine the links between second-hand smoke and cancer. 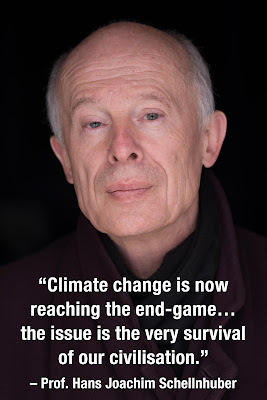 Singer, currently an adviser to Australian climate sceptic group the galileo Movement, was also hosted twice by Australia’s Institute for Public Affairs in the early 90s as the Melbourne-based free market think tank began to build its anti-climate science campaign, which continues to this day. Also featured in the PBS documentary was Myron Ebell, a director at the Competitive Enterprise Institute which was another group active in helping to build early support for climate science denial in Australia. The Cato Institute’s Pat Michaels, who once admitted that 40 per cent of his funding came from the fossil fuel industry, was also featured. Michaels is currently an advisor to the newly-formed Australian Taxpayers’ Alliance. And of course, no documentary on climate science denial would be complete without a few sage words from the madcap Lord Christopher Monckton. Broadly, it’s obvious what effect these orchestrated campaigns of doubt on climate science (and also attacks on renewable energies) are designed to have. They want to delay any laws that will help the developed and developing world to move away from what should be seen as a risk-laden fossil fuel habit. They also have an innate paranoia of socialism and communism. They claim that environmental legislation is taking away people’s “freedoms”. I wonder if that includes the freedom to be evacuated from a massive storm, the freedom to have your crops wiped out by drought or the freedom to pay increased taxes to pay for clean-ups from “natural” disasters? Before Hurricane Sandy hit, on Forbes’ Corporate Social Responsibility blog, Gregory Unruh asked if climate denialists would be seen in the future as having committed “climate crimes against humanity”. In my eyes, the answer to this is no because there are people who have the power to ignore their campaign. As storm system Sandy breaks American hearts, it puts the US Presidential campaigns on hold and brings Wall Street, a spiritual home for capitalism, to a stand still. Will it be long enough for leaders like Obama, Cameron, Gillard and Jiabao to ask just where their “leadership” is taking us?